The German Grand Prix was a startling fight with rain taking center stage and producing an intensely interesting race. In an event that saw the pole sitter retire and Lewis Hamilton surge from the back of the grid to the point yet again, it was a seriously great event for all who saw it. The title implications of this event will reverberate for the rest of the season. After woes in qualifying saw Mercedes star driver Lewis Hamilton starting from 14th, he had some work to put in today in Germany to score the points he needed to rebuild his championship defense effort. With title rival Sebastian Vettel starting on pole, he knew it would be a rough day from the get go. While Hamilton had a dozen cars between him and Vettel, Sebastian had the lead and a comfortable gap to Hamilton’s teammate Valtteri Bottas in second. 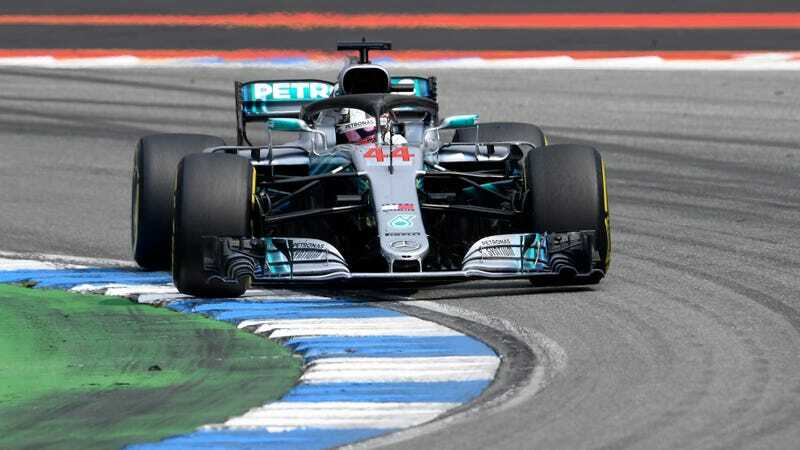 In the course of the race, Hamilton moved himself up to fourth in just the first 25 laps of the Grand Prix, putting on a show with passes lap after lap at the Hockenheimring’s signature hairpin. Raikkonen pitted and returned just in front of Hamilton after Bottas and Verstappen pitted to return behind the British champion. At lap 30, Hamilton trailed only the Ferrari pair of Raikkonen and Vettel. It was clear that their two-stop strategy was putting them on level pace with Hamilton’s one-stopper. With the threat of rain in the area, Mercedes told Hamilton to extend his stint as long as possible, then potentially pit once for a set of rain tires, rather than going out on new slicks only to have to come back in for wets. Meanwhile, Vettel is getting heated as he is forced to trundle around behind Raikkonen, he repeatedly asks the team to allow him into the lead to preserve his tires. The Ferrari team gives Raikkonen a non-committal “We need to save tires on both cars, do not hold up Seb” over the radio. Eventually he moves aside for Vettel. Not able to hold on any longer, Hamilton pits for a set of ultra soft tires while the radar predicts rain in the next ten minutes. Within one minute of his return to the track, rain is falling at the hairpin. The team instructs Hamilton that pitting again for wet tires is his call. All of the leading cars stay out on slick tires to avoid pitting for rain tires. Hamilton’s fresh ultra softs are better prepared to deal with light rain than Vettel’s worn softs. Some runners that pitted for rain tires are already back in to change back to slicks. And then a big shower comes and cars are off tack everywhere. Vettel clangs into the barrier from the lead, ending his race and promoting Bottas to the lead, who had just passed Raikkonen. When the full course yellow safety car period came to remove Vettel from the track, both Bottas and Raikkonnen pit from first and second, which leaves Hamilton to lead. Hamilton looked to pit, but his team told him to stay out last second and he was forced to take to the grass in order to rejoin the track. It turned out that was the correct move. As the track begins to dry out behind the safety car, both Williams cars expire at the slower pace. The safety car pulled off, leaving Hamilton ten laps of sprint ahead of him. His tires are not quite as new as those of Raikkonen and Bottas behind. Bottas puts in a good effort to pass Hamilton, but eventually backs off and settles for second. After falling back slightly with a mistake, the team tells him to hold station and let Hamilton win. From 14th on the grid to first at the finish. I’m no fan of Hamilton, especially after his Austrian Grand Prix radio whining, but it’s difficult to deny that he’s an amazing racer when things fall his way. He put in a stellar race in Germany, similar to his monster effort at the British Grand Prix a couple weeks ago. He fought for, and earned, these points. Of course, luck had a lot to do with it. Hamilton now re-takes the lead of the championship over Vettel with 188 points to 171.